Judy’s email address is no longer valid, but we still have a mailing list of people looking for this dog from their childhood. 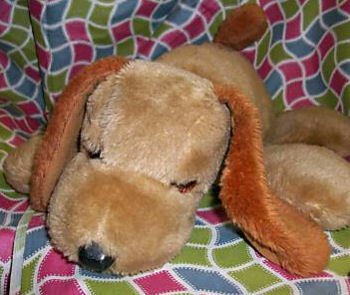 I’m looking for a 70’s Napper the talking dog made by Mattel that is still in working condition. He would say phrases such as ”I’m lonely”, ”Ruff, Ruff, Ruff”, and some others. It is amazing how dear and comforting this little dog was to so many! My daughter is 30, and still misses him. Mattel is missing an opportunity – they should bring him back. I have been looking for three years. with no luck. Can’t even find something similar. I made the mistake of discarding him because the voice mechanism worn out. I don’t think she has ever completely forgiven me. I would really like to replace him. Her little girl is 3 yrs old, and it would be so perfect. I know this is off topic, but congratulations on being surfer of the week! He’s talking about ExposeYourBlog in case anyone has a blog and would like to meet other bloggers. I use EYB as one of the ways I spread the word about Plush Memories. The more people who know about us, the more people we can help!